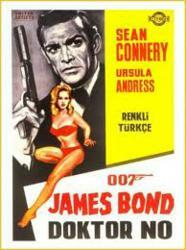 Dr. No: The Very First Theatrical James Bond Movie Celebrates 50 Years! "Bond. James Bond," is known as one of the most famous movie quotes of all time, and now 50 years later, it's still repeatedly referenced. More than 20 movies featuring Ian Fleming's super-sleuth James Bond have been released over the years and Movies Unlimited is noting the anniversary of the first movie, Dr. No. Dr. No Celebrates 50 Years! "Bond. James Bond," is known as one of the most famous movie quotes of all time, even more popular than "Show me the money" or "We'll always have Paris" and now 50 years later, it's still repeatedly referenced. More than 20 movies featuring Ian Fleming's super-sleuth James Bond have been released over the years and Movies Unlimited is noting the anniversary of the first movie, Dr. No. United Artists released 22 of the amazingly popular films through the years, the first of which was Dr. No, released on October 5, 1962. It had its world premiere at the London Pavilion, in Picadilly Circus. In the audience that night was Sean Connery, the star of the film and the author of the original spy novels, Ian Fleming. Oddly enough, it's been reported that originally, Fleming wasn't impressed with the producer's choice of Connery as "007" but once filming got under way, he realized the actor was cast perfectly. More trivia about Dr. No: The role of Honey Rider, the first "Bond Bombshell," wasn't cast until just two weeks before filming began. It's been told that the producers saw a photo of Ursula Andress taken by her husband John Derek, and immediately envisioned her in the role. At the time, she wasn't very interested in a film career but her friend Kirk Douglas had confidence she would be ideal as Honey, and helped convince her to do it. Movies Unlimited is featuring fun reading material about James Bond on their blog site MovieFanFare, found at http://www.moviefanfare.com. In honor of the 50th Anniversary of the first 007 movie, a new boxed set has been released on DVD, appropriately called Bond 50, containing 23 discs, one for each of the 22 films in the collection and one disc devoted to extras that collectors so often enjoy. Movies Unlimited is one of the world's oldest and most reliable video retailers, specializing in DVD and Blu-ray titles. The Bond 50 collection and thousands more can be ordered through their website at http://www.moviesunlimited.com or by calling 1-800-4-MOVIES. The Philadelphia-based company also publishes the annual 800-page encyclopedic Movies Unlimited DVD Catalog.